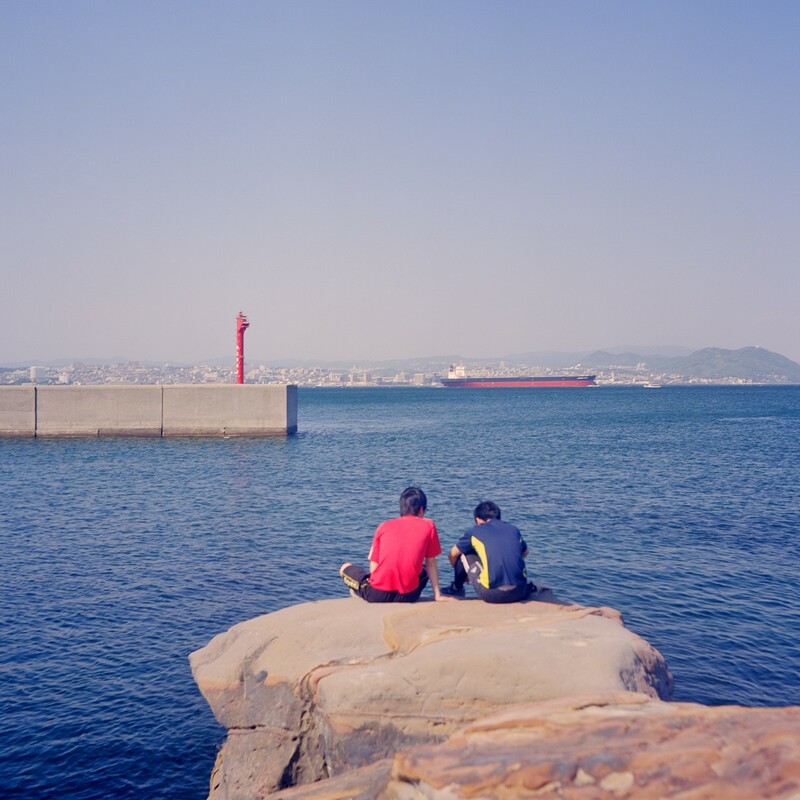 We often go to Akashi, a town down the coast east of Kobe. It has a nice sleepy atmosphere, a good market street and some excellent food (octopus fishing is a big thing here). 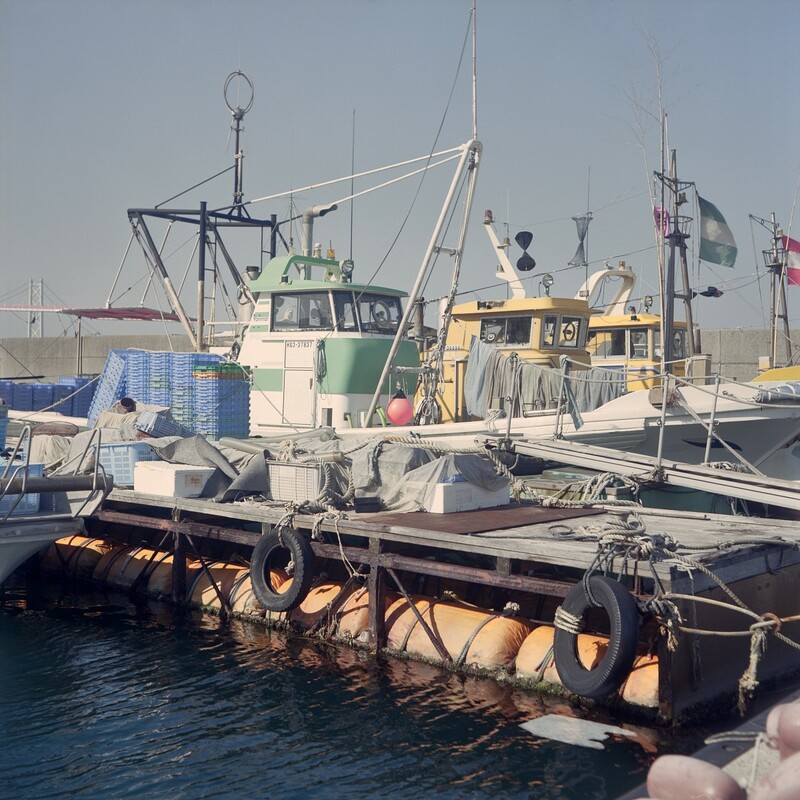 In the harbour we've often seen a ferry go back and forth between Akashi and the nearby island of Awajishma. If you look at a map, Awajishima is in the middle of Osaka bay, right between the mainland and Shikoku. It's really close — you see it from the Osaka waterfront, and I was looking at the island from my previous job every day — and yet I had never once been there. Ritsuko, an Osaka native, had been there once on a middle-school trip, but never since. 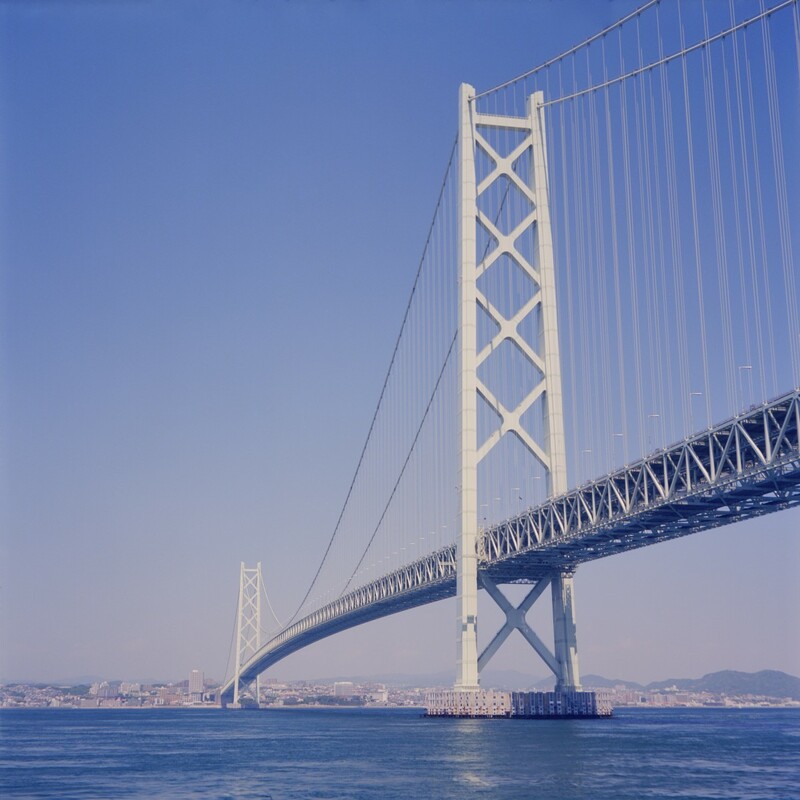 Akashi Kaikyo O-hashi — The Great Akashi Bridge. Yes, It's huge. So this time we didn't just look at the ferry; we bought tickets and took the 15 minute crossing to the island. There's two towns, Awaji and Sumoto, and there's a highway connecting the mainland with Shikoku, using the huge Akashi bridge. The ferry doesn't go to any of those places, though, but to a small fishing village called Iwaya near the northern tip of the island. It's really mostly a commuter ferry for people living in Iwaya but working, studying or shopping in Akashi city. away. It really is a different world. 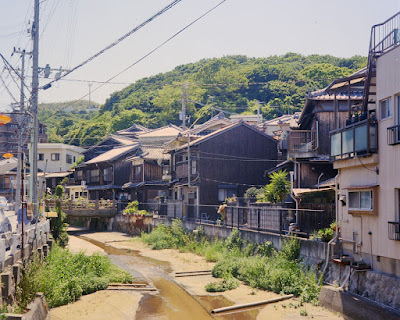 Awai itself is a fishing village and suburb to Akashi. We went mid-morning, thinking we'd eat lunch in the village. But there's only 3-4 places to eat within walking distance of the ferry landing (two of them in the ferry terminal itself) and they were crammed full, with people waiting in long lines outside. Awaji may not be a tourist destination, but somebody forgot to tell the tourists. A large group of Koreans, two buses with boy scouts and a big pile or random people such as ourselves was just too much for the place. 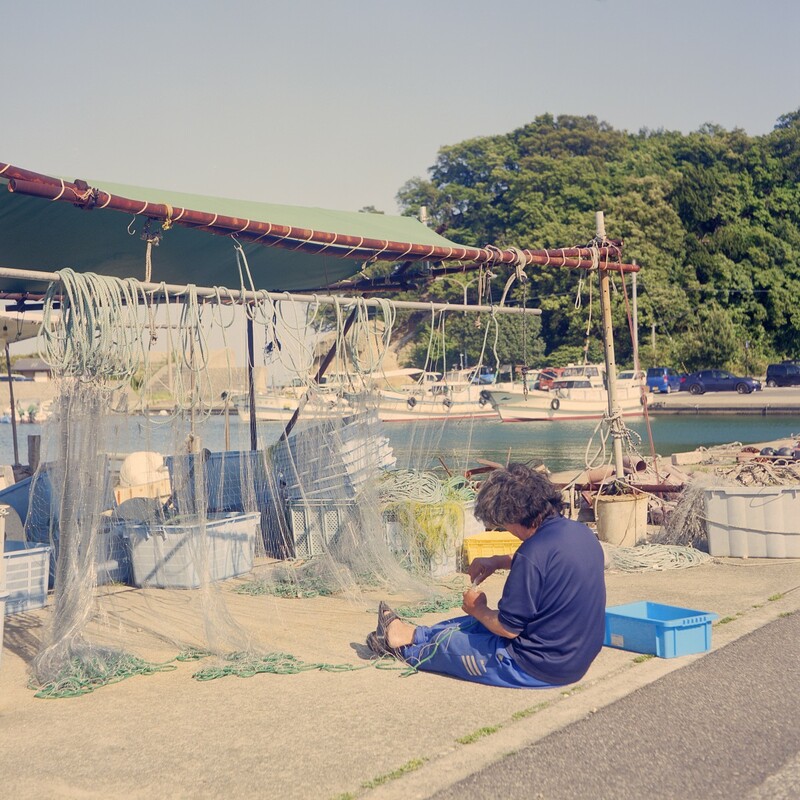 It's a fishing village, and most of the waterfront is all about fishing. 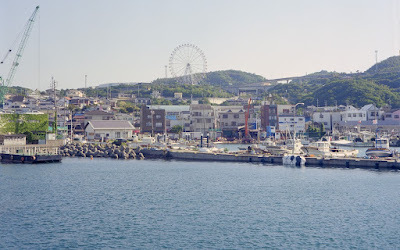 In the end we bought some bread and fruit in the terminal building — there's not even a convenience store, that's how small this place is — and enjoyed al fresco dining overlooking the Seto sea and the Great Akashi bridge. A view from the big cliff in the harbour. 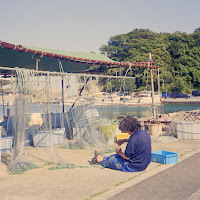 We took a long stroll along the seaside, looked at the fishing boats and just generally enjoyed an afternoon together with no commitments and no stress. Stop your life for a moment to smell the flowers. Late afternoon we boarded the ferry again and took the train back to Osaka. I can recommend this trip - but don't expect to actually do anything, and if you go, remember to pack a bento lunch. The pictures here are taken with the Meopta Flexaret, the TLR I bought in Prague last year. 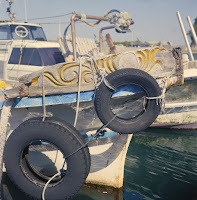 Overall I like the results I get with colour film (Ektar 100) using this camera. The camera works fine, although the infinity focus seems to be a bit off. I'll have to take a closer look at that. This is absolutely ridiculous. I had the Bali pictures all done in January. This text was drafted months ago. All I had left was to cut down and edit the draft, and pick the pictures. But I was busy, one thing led to another, and weeks turned into months. It became embarrassing to post this, but at the same time I didn't want to "skip the line" with other posts either, so this was holding me up. So, here it is, five months late, unedited and too long, our winter trip to Bali. Our winter holidays found us going to Bali, Indonesia. The idea felt very exotic — "Bali" has the otherworldly, far-away vibe of "Tahiti" or "Ulan Bator" to me. But it's really no farther from Osaka than the Canary Islands are from Sweden. Half a million Japanese visit each year (the fifth largest group), and there's a fairly large Japanese community living there. Because of my work schedule and flight costs we decided to go between Christmas and New Year, returning on New Years morning. It's high season, but not too many people want to spend New years eve at an airport so it was easy to get a cheap flight. We picked Bali because a friend of Ritsuko has a daughter that works as a web developer on the island. Any place becomes more fun to visit if you know somebody local, and a friend of hers runs a small 4-room hotel/villa in a village outside Sanur, called Villa Beachside. These kind of villas are really common on Bali, and surprisingly inexpensive - less than a cramped business hotel room in Japan. There's only four rooms, and they are almost never all rented out at once, so you usually have the entire place all to yourself. You have a dining area, roof terrace, pool and a common kitchen and fridge if you want to cook. You can really treat it as your home. It's a bit remote but the staff will drive you to nearby Sanur for free, and you can rent car and driver for trips elsewhere. I can recommend that too — it's really helpful to have somebody local to help you find things. A room at the villa. Indonesia is a bit odd. It officially has freedom of religion, but that "freedom" is restricted to one of six required religions: Islam, Buddhism, Hinduism, Catholicism, Protestantism and Confucianism. Everybody must belong to one of them, and people take religion very seriously in public(1). Bali is unique in Indonesia for being almost exclusively Hindu. The few other believers are all migrants from other parts of the country. Bringing food offerings to the compound shrine. Hinduism seems to completely suffuse Bali life. People say there's more shrines than people on the island and I have no problem believing it. There are many religious rules, and older people at least seem fairly strict about following them. The gods are assumed to reside on Agung, the central mountain on the island, so all shrines are directed toward the mountain, and you always - tourist hotels included - sleep with your head toward the mountain and the feet away from it. In general, shrines and holy bits are placed higher up, while common or dirty areas are lower down. As a consequence you can't build buildings taller than that of the nearby temples. So Bali is blessedly (sic.) free from high-rises and tall, ugly resort hotels marring the view. There are plenty of hotels of course, but they're all low-slung and meld into the landscape rather than break away from it. This is great for the atmosphere on the island, and I hope they keep enforcing this rule. Our view from the villa. Not a high-rise in sight. Many Balinese live in traditional family "compounds", where an extended family shares a large, walled area with multiple buildings. The shrine area is closest to the mountain and highest up. Larger compounds are then divided into a middle area in the center with living quarters for the family heads and ceremonial buildings; and a lower, "dirty" area at the bottom with bathrooms, kitchens and where most members actually live. A family compound entrance. Could plant this design into any CRPG unedited and nobody would bat an eyelid. Same thing with some Japanese temples by the way; of course game designers will take inspiration where they can find it, and exotic, far-away locales are a good source of inspiration. The island villages seem largely organized in compounds as well. The streets are lined with high walls, broken with ornate gates that lead inside. The repeated similar pattern feels more than a little like an early 90's adventure game. There's a fair number of small shops and restaurants ("warung") facing the street, run by the family inside. Table coral in shallow water. The diving and snorkelling is wonderful. Bali is part of a long island chain, and a sea current flows across the chain from north to south. That makes the sea around the island absolutely teeming with life, with large stretches of multiple types of coral and sealife. It's comparable to Okinawa, which is high praise indeed. We took a half-day snorkelling trip to Lembongan with Mango Dive, a diving shop catering especially to Japanese visitors; and, not incidentally, owned by another friend of a friend. This was the one thing we really splurged on: a small chartered boat with just the instructor, the boat driver and the two of us. It takes about thirty minutes from the south end of Bali to the north tip of Lembongan. The hotel tours and big charters all go to the same few snorkelling and swimming spots. Those places have reliably good conditions, and it also limits the damage to a few specific places. Of course, that also means lots and lots of people crowding in at the same spots; some operators even keep barges permanently anchored there, with cafes and enclosed "pools" for children. 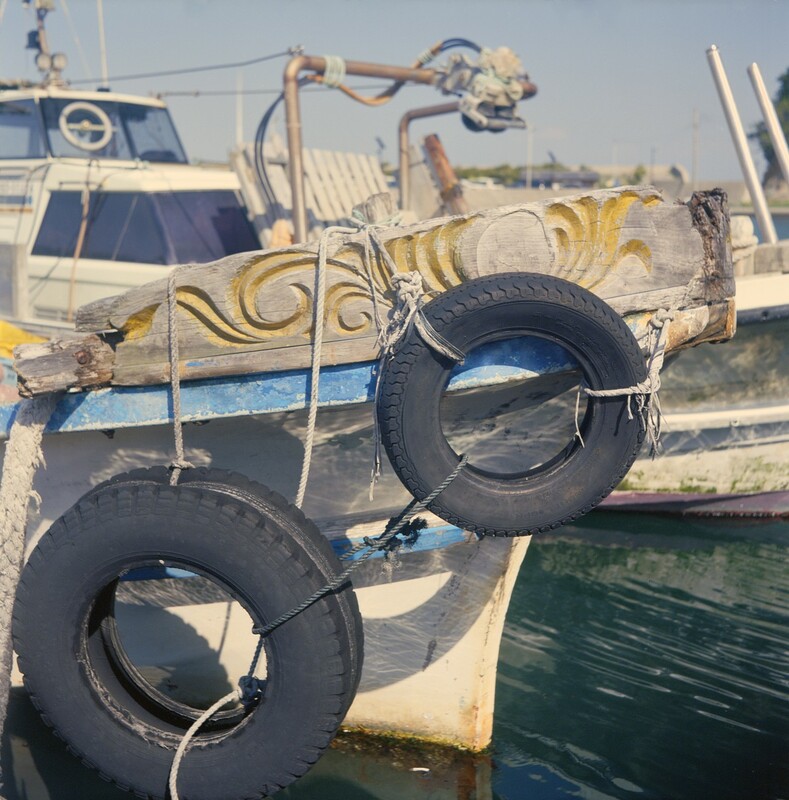 With a small boat, we could go to a different area with far fewer people and more sealife. With only the two of us to keep an eye on, we could snorkel at spots with fairly strong currents and still be sure we wouldn't be lost if we got dragged along faster than we realized.The current does make snorkeling a little challenging; you have to work to stay in place or you quickly drift away. Possibly an anemone on the left, and some deeper corals on the right. This was really the single best part of the entire trip. The boat crossing to the smaller island; the snorkelling; eating spicy chicken fried rice for lunch on the roof of the boat — it was all great. Free diving and snorkelling is a lot of fun, but it's frustrating that you only get a few seconds at a time at the bottom to take pictures. I really want to get a diving licence for next time. We try to go to a cooking class on our trips. We both enjoy cooking, and it's a fun way to learn a bit more about the local flavours and preparations. We went to Lobong Culinary Experience toward the central part of the island. It's held in a large family compound, run by a professional former hotel chef. Lots of ingredients. Some familiar, others less so. Cooking classes all tend to follow the same order of events, and this one is no different: you visit a market in the morning, where you can see, touch and smell local produce and common ingredients. Then you go to the family compound, where the guide tells you more about how the compound is organized and a few tidbits about Balinese social customs. Then we got down to cooking. The menu included minced chicken skewers, grilled chicken, a couple of salads, and a dessert. We were about 15 people, so we all made some different part of the finished meal. It was very well organized, with helpers doing prep work and cleaning up at all stages. At the end, we enjoyed our food for lunch. The salads and chicken skewers. Delicious. The class was not bad, but I honestly think the food is too, well, professional. Some of the steps - actually grilling the chicken for instance - happened completely out of sight, and with so many students none of us got to make a whole dish from start to finish. I'd much rather make one or two dishes from start to finish than bits and pieces from a dozen ones. This made for great food, but not such a great learning experience. Next time we should look for a cooking class with fewer students and home-cooked style dishes instead. The cooking class compound. This is the central area reserved for ceremonies and senior family; the two buildings in the background is the rice storage. Lunch at a Warung. Picture by Ritsuko. Speaking of food(2), we had dinner at the villa when we arrived, ate twice at regular restaurants and made sandwiches at home once. Other than that, we mostly ate at some warung or other. A warung is a small family-run street-side restaurant or convenience store. The food and interior both tend to be rustic, and it can take a bit of courage to eat at such a place the first time. A typical restaurant warung has a selection of rice dishes, toppings and soups, heavy on the chicken(3). You typically have a short menu on the wall behind the counter, and a large glass case on the counter-top with bowls of today's toppings, ranging from fried fish (and chicken, naturally), to vegetables, fermented beans (think crunchy, delicious natto) and hot sauces. You order rice and the toppings you'd like to have. Then grab a drink and sit down to eat at one of the tables. Fun, simple, and often so very delicious. One warung nearby has a chicken soup (above on the left) that I could happily eat for the rest of my life. A warung at a local market. We loved this place. And we're absolutely going back. I'm even thinking of learning Indonesian. It's an easy language after all, and you can use it throughout south-east Asia. #1 You can get arrested, convicted and sentenced to prison for stating that you're not religious. It's impossible to know the real number of actual believers in such a situation, but it's a reasonable guess that not everybody is as religious as they make out to be in public. #2 I always do, I know. #3 All food here is heavy on the chicken. So are the streets, the backyards, garden walls and vacant lots. You wake at sunrise every morning to the verberating sound of dozens of chicken flocks in the neighbourhood greeting the sun.